Why is a Linear Equation Called Linear? From time to time we get a question that is more about words than about math; usually these are about the meaning or origin of mathematical terms. Fortunately, some of us love words as much as we love math. But the question I want to look at here, which came in last month, is about both the word and the math; in explaining why the word is appropriate, we are learning some things about math itself. Why is an equation like 2x + 4 = 10 called a linear equation in one variable? Clearly, the solution is a point on one axis, the x-axis, not a line on the two-axis Cartesian coordinate plane? Or are all linear equations in one variable viewed as vertical lines? Clearly, she is saying, the phrase “linear equation” means “the equation of a line”. And there is a similarity between the linear equation in one variable above, and a linear equation in two variables, such as \(y = 2x + 4\), which definitely is the equation of a line. 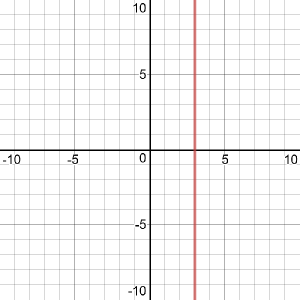 But with only one variable, the only way to say that \(2x + 4 = 10\) is the equation of a line is to plot it on a plane as the vertical line \(x = 3\). Is that the intent of the term? 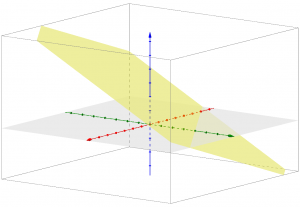 The term “linear”, though derived from the idea that a linear equation in two variables represents a line, has been generalized from that to mean that the equation involves a polynomial with degree 1. That is, the variable(s) are only multiplied by constants and added to other terms, with nothing more (squaring, etc.). So you could say that the term has been taken from one situation that gave it its name, and applied to more general cases with different numbers of variables. A linear equation in three variables, for example, represents a plane. A linear equation is an algebraic equation in which each term is either a constant or the product of a constant and (the first power of) a single variable (however, different variables may occur in different terms). A simple example of a linear equation with only one variable, x, may be written in the form: ax + b = 0, where a and b are constants and a ≠ 0. Linear equations can have one or more variables. An example of a linear equation with three variables, x, y, and z, is given by: ax + by + cz + d = 0, where a, b, c, and d are constants and a, b, and c are non-zero. But, still – it’s not a line! Thank you so much. I am very particular with terminology when I teach mathematics. I have to say, I do not like this generalization of the term. I think it is misleading. Hmmm … is the term “linear” misleading? Not to mathematicians, and I would hope not to students once they get used to it. Yet it’s true that it doesn’t quite mean what it seems to say. And is generalization bad? I think it’s the essence of what math is – and also an integral part of languages,which are always extending the meaning of words to cover new needs. Thanks for writing back with additional thoughts. Let’s think a little more deeply about it. First, this is standard terminology that has been in use for 200 years by many great mathematicians, so we should be very careful about considering it a bad idea. I don’t think you’re likely to convince anyone to change; the word is used not only of a linear equation in itself, but of “systems of linear equations” (in contrast to “non-linear equations”); of the whole major field of “linear algebra”; and for related concepts like “linear combination”, “linear transformation”, and “linear independence”, all of which apply to any number of variables or dimensions. So the term is very well established with a particular but broad meaning, and (at least after the first year) no one is misled by it. We know what it means, and what it means is more than just “line”. I could say that, in a sense, all of mathematics is about generalization (or abstraction). I just mentioned “number”; some people do complain about calling anything other than a natural number a “number”, but the logical development from natural numbers, to integers, to rational numbers, to real and complex numbers, involves repeated broadening of the term, which has been extremely useful. We invent new concepts, and give them old names because they are a larger, more powerful version of the old concept. And thinking again about math terms, I’m reminded of this discussion where I pondered what all the different operations that are called “multiplication” have in common. Now, I’ve been mostly thinking of the “enlarging” development of the word “linear”, taking it to more than two dimensions; you’re thinking specifically of the term used with only one variable. So it may help if we focus on that, to fit your particular context. I’d like to explain linear equations in one variable in a way that should make it clear why we use the word, and that it is not a misnomer. Consider the equation you asked about, 2x+4=10. 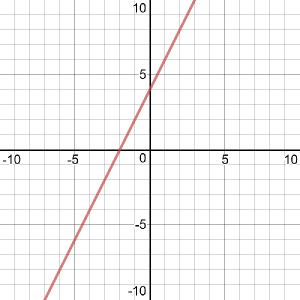 The left-hand side is an expression; we call it a linear expression, because if you used it in an equation with two variables, y = 2x+4, its graph would be a straight line. So we call 2x+4 a linear expression (or, later, a linear function). A linear equation in one variable is one that says that two linear expressions are equal (or one is equal to a constant). Or, to look at it another way, one way to solve this equation would be to graph the related equation y = 2x+4, and find where that line intersects the line y = 10. So the linear equation can be thought of very much in terms of a line. Yes, your response does help very much. In addition, it gives me a lot to think about. It is true, the grade level I am currently teaching does learn to solve linear equations in one variable before they learn about linear equations and functions. Perhaps this is why I question the use of the term. I must remember that I have had experience in mathematics beyond their years, and therefore, am more thoughtful about what terms they are exposed to and more importantly in what sequence the mathematics is presented to them. I thank you again for such an in depth response and will certainly give this discussion much more thought. It is a pleasure speaking with you. And what’s the difference between an identity and an expression? Second, an identity is not an expression, but an equation (that is, a statement that two expressions are equal). In particular, it is an equation that is true for any value of the variable(s) it contains. For instance, a+b = b+a is an identity.